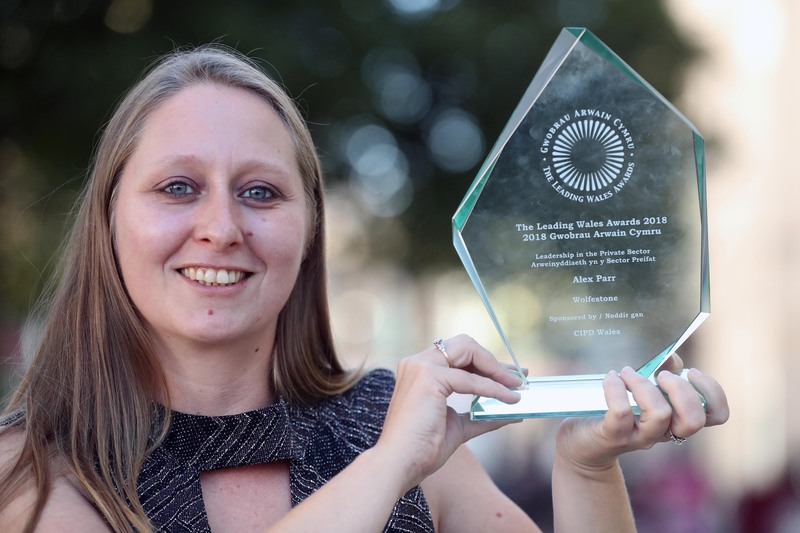 Wolfestone Holdings’ Managing Director, Alex Parr, was recently named the winner of the Leadership in the Private Sector award at the Leading Wales Awards 2018. Now in its 14th year, the Leading Wales Awards identifies and celebrates extraordinary personal achievements and outstanding leadership in Wales. Their award categories are diverse, encompassing the private and public sectors, voluntary organisations and young leaders under the age of 25. Shortlisted alongside three of Wales’ most talented leaders in the private sector – Angharad Gwyn (Adra Cyf), Tracey Jones (Ferguson & Peter’s), Katie Moss (Otium Partners) – Alex’s outstanding contribution to, and leadership of, Wolfestone Holdings over the past year has been recognised and rightly celebrated. Alex started with Wolfestone in 2013 as Sales Manager and was placed on our internal Fast Track Director programme. Three years later, she was made Managing Director and is now responsible for ensuring the success of the Wolfestone Holdings Group which comprises Wolfestone Translation, VoiceBox and Robertson Languages International. People who’ve worked alongside Alex have witnessed first-hand her natural ability as a leader and have been inspired by her journey and progression. Alex approaches every challenge she faces with a positive mindset and can-do attitude which all Wolfestone Holdings’ employees aspire to emulate. As well as Alex’s incredible individual achievement, Wolfestone Holdings was highly commended by the judges of the Inspiring Great Leadership (Organisational Award) category. Wolfestone would like to offer its congratulations to all the winners and nominees of the Leading Wales Awards 2018.